Hells Canyon Raft’s Hells Canyon / Snake River charter rafting trip in Idaho and Oregon. Hells Canyon is the deepest canyon in North America, and forms the border between Idaho and Oregon. A river trip is the perfect venue to bring together a multi-generational group. Let Hells Canyon Raft show you a first class whitewater rafting trip. Want some great reasons to form your charter group? 1. The trip is all yours. With our low guide to guest ratio we can accommodate most any request. We have taken guests as old as 91 and as young as 4. Our recommended age is 7 years old. We can take up to 19 guests. During late June, July and early August, 15 guests is all it takes to charter. Tell us what you want. Our goal will be to provide. 2. Fun Rapids. Hells Canyon has some of the largest rapids in the Northwest. The river is a pool and drop river meaning boulders have dammed the river forming pools behind, and drops over the boulders. The large volume of the river means there is really no danger of rocks. Large, wet, fun waves are what you will encounter. 3. Choose your river craft. We have a mix of boats. Oar boats where the guide does all the work with two large oars are great for lounging and fishing. All you need to do is hold on. Paddle boats let you get into the action. The guide steers from the back and coaches the group through the rapids. Or try an inflatable kayak. These one person sit on top kayaks are surprisingly easy to run. During calm stretches or at camp you can get some exercise on a Stand UP Paddle Board. The more daring can also try them in the rapids. 4. Old Homesteads and Ancient Rock Art. We stop several times throughout the trip to check out old Homestead cabins. Check out the original wallpaper of old Saturday Evening Post pages glued to the walls. Native Americans left their art work in several different places along the river. Some of this art work is over 7000 years old. 5. Fishing. We don’t want to jinx it but… The fishing in Hells Canyon is Excellent. We provide all the gear and can almost guarantee you will catch a fish. Mostly we catch rainbow trout, and bass. 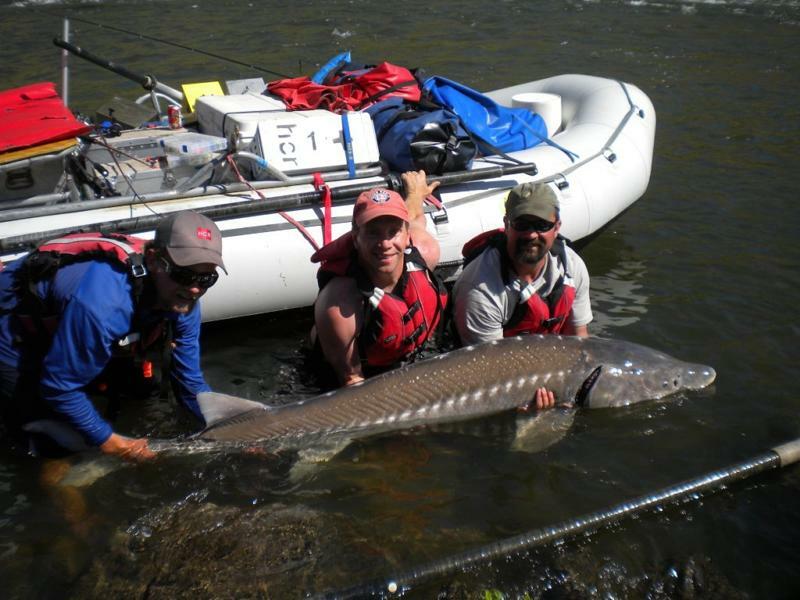 The river also has catfish, carp, northern pike, and white sturgeon that can reach up to 9’ in length. Yep! The fishing is fantastic! 6. Small group charters. During May, early June, and September we offer small group charters. With as few as 6 guests we can make a charter trip happen. Click on the schedule and rates tab for each different trip to find available dates and prices.